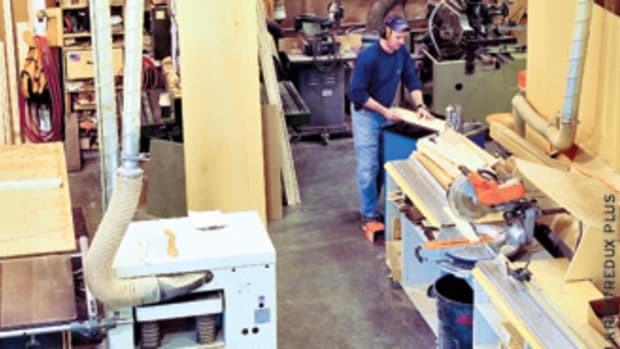 Every woodshop manager knows there are myriad reasons for dust and fume collection, from employee safety and comfort to the quality of finishes on parts. And while much of the process of maintaining a clean environment is fairly inexpensive and easy to install, most woodworkers always feel that we haven’t quite done enough. A woodshop is never going to be as clean as a kitchen or lab, but there’s really no reason why it can’t come close. So, here are nine ways that an average shop can spruce up its air, become a safer and more enjoyable workplace, and perhaps even let the owner sleep better. A dust collection system needs to do two things. First, it must be able to gather all the dust and chips, and second, it has to return clean, scrubbed air to the shop. And while some woodworkers spend an inordinate amount of time tweaking the hoses and trying to place them in the most efficient spot, they often ignore the bags on their collectors. It’s important to take a good, hard look at the ones supplied by the factory that built the collector. They are often the weak point in the whole system. 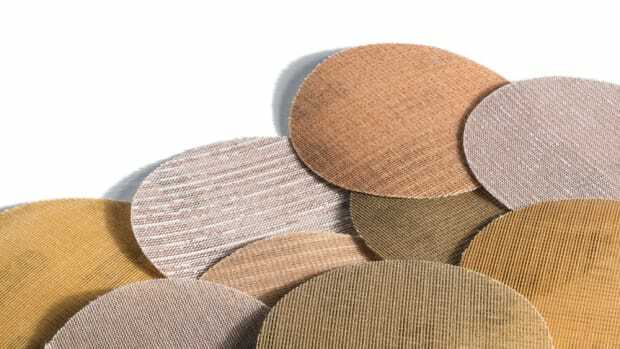 First off, smaller units will usually benefit from an increased filter area and thicker fabric. The idea here is to create the proper airflow without back pressure. You don’t want to slow the flow (velocity), because then dust in suspension tends to drop out. And you don’t want to have bags that allow so much flow that they don’t capture and keep fines. Bag suppliers such as American Fabric Filter (americanfabricfilter.com) and Dust Collection Bags (dustcollectionbags.com) will help a shop make better decisions here. Servair (servair.net) in Brampton, Ontario, and has just come out with a series of booths for woodworkers. Intended for sanding, routing and cutting stations that generate large amounts of airborne dust, they’re designed to stand alone (they don’t need to be connected to a central system) and they provide over 27 air changes per minute in the immediate vicinity of a typical work station, according to the company. They come fully assembled and require just electrical and compressed air hook-ups to operate. They’re even self-cleaning – a woodworker can set them so they reverse the airflow at set cycles, and that reverse pulse drops the dust into removable plastic bins. And here’s the best part - exhaust air is twice filtered to MERV 15 and returned to the plant, so there’s no need for outside air make-up. Standard models are available in 6’, 9’ and 12’ widths. 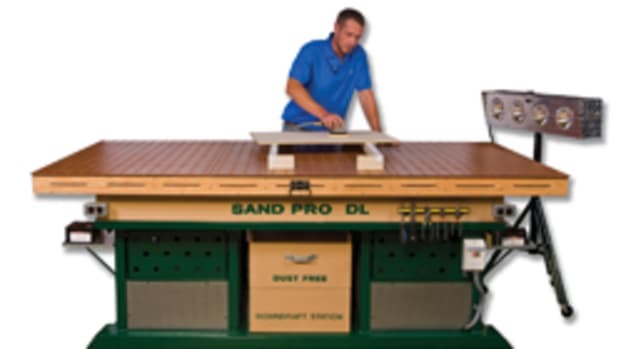 SandMan Products (sandmanproducts.com) offers the Sand Pro sanding booth, which is a self-contained, portable solution to collecting dust on items that are too large to fit on a sanding table. This is all about resistance. The smoother the hose, the shorter it is, and the more appropriately sized it is, the better it will work. Hoses and ducts are a good argument for small shops to consider installing several stand-alone collectors rather than an underpowered central system. Being able to place the vacuum within a couple of feet of a machine is definitely better than running hoses all the way across the shop. Larger industrial systems can generate much greater volume and velocity, so they can remain relatively efficient over long distances. But a small, one-man shop might want to consider several portable yet still powerful units. The only drawback is that there are more bags to empty. One of the more controversial trade tariffs imposed of late is on steel and aluminum, and this has affected the cost of ductwork. But steel ducts are easily grounded, and very durable, so an increase in cost has to be balanced against the benefits derived. Oneida Systems (oneida-air.com) has been around since 1993 and specializes in nothing but dust control. 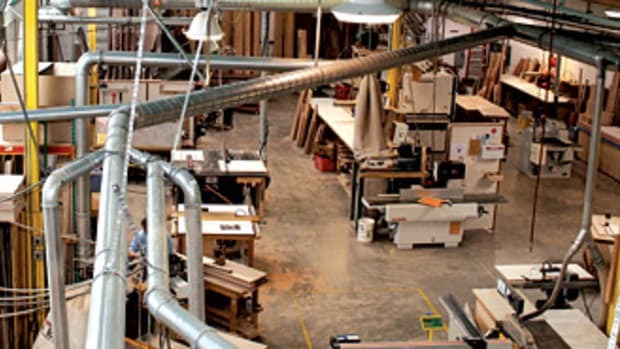 The company will help a woodshop develop a professional layout designed to take maximum advantage of a collector and its ductwork, and it also offers both standard snap lock and spiral pipe and quick-clamp ducting. The complete catalog is online, and it includes both collectors and pipe. It also has details about the new Super Duty Deputy cyclonic retrofit, which can turn a single stage (1/2- to 5-hp) small shop dust collector into a cyclone model. If you decide to go nonmetallic, the choices are wide. For example, Air Handling Systems (airhand.com) in Woodbridge, Conn., stocks 15 different types of flexible hoses from 2” to 12” in diameter. If you run European machines, you can order their poly flex hose in metric increments. Other hoses are designed specifically to handle the abrasive nature of wood particles, or to infuse the system with antistatic qualities. There are varying degrees of flexibility, too. For example, the hose on a stationary sander needs to move a lot less than the hose on a panel saw or CNC. Masterduct (masterduct.com) offers a full catalog of woodshop appropriate hoses. They don’t just run the gamut of dust and chips: the company also offers hoses that can handle fumes from finishing processes, including high temperature versions for plastics. And Nordfab (nordfab.com) in Thomasville, N.C., offers a modular system called Quick-Fit that clamps together quickly but is incredibly sturdy. It requires no rivets, screws or welding. How well a vacuum works will depend on two things – speed and volume. And these are also intertwined – the more air a unit has to pull, the slower it will travel. So, woodshops use blast gates to isolate machines, and turn off the collection on equipment that isn’t being used. If your ductwork is collecting from a dozen machines, and all the gates are open, it is at its least efficient. But people are inherently lazy about opening and closing blast gates, and it’s also easy to miss a couple and leave them open when they should be shut. Automation means that the gate automatically opens or closes when a machine is turned on or off. 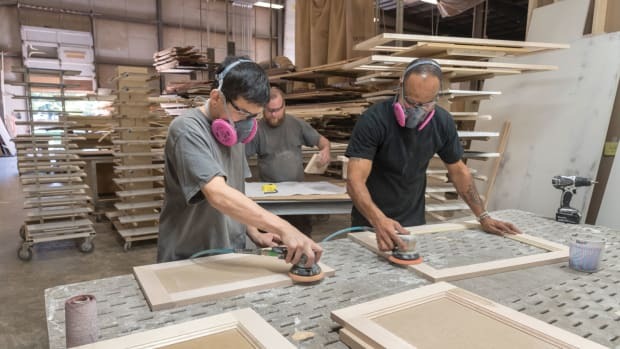 EcoGate (ecogate.com) has taken this to the highest level, and the company’s patented control system makes industrial wood dust collection systems run better while reducing energy use by 50 to 75 percent. When a shop is running a bag system for 40 hours a week or more, that can really translate into serious savings over the course of a year. GrnGate (grngate.com) has a system that is aimed more at the home woodshop and small to medium cabinet shop. It involves a system controller, individual gates and a sensor at each machine. Simply start the machine, do the task and turn the machine off. A sensor detects when the machine is started and opens the tool’s associated blast gate. This in turn, starts the dust collector. The difference between large and small shop systems is that the large collector is running all day as it services several workstations, while the small one only turns on a collector when needed. 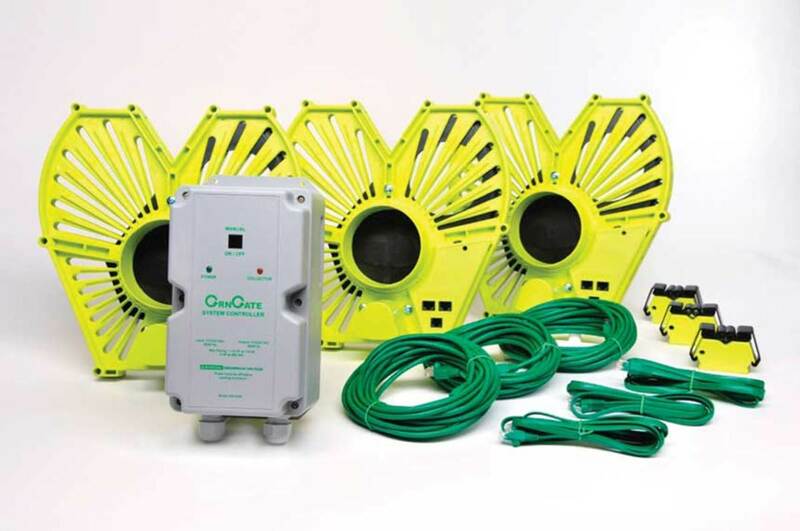 GrnGate offers a 3-gate Starter System that has 4” gates, three sensors, the controller and all the necessary cables. The Sand Pro SBP108 sanding booth from SandMan Products. One might think the odds of a dust explosion are slim, but they happen on a remarkably regular basis. And it’s not just fine dust: finishes can also ignite. US Duct (us-duct.com) offers a new series of spark traps and industrial spark arrestors that work in existing or new collection systems. For larger shops, GreCon (grecon-us.com) offers industrial scale spark detection and extinguishing systems. The company says that a dull tool, a damaged fan bearing, an overheated motor or a foreign object within the material can cause a spark and take out even the largest bag system. GreCon’s spark detection and extinguishing systems can reduce that risk by detecting and extinguishing sparks and embers before they reach the dust collector, filter or silo. One way to control dust is to isolate the workstation that generates it. And surrounding a workbench or tool with a see-through wall is an inexpensive way to do that. Goff’s Curtain Walls (goffscurtainwalls.com) started out as a solution at an auto body shop that needed to isolate paint booths so that customers didn’t get rainbow colored cars. Today, they can be found in many woodshops to contain sawdust, overspray, temperature, fumes and noise. They also maximize usable shop space and help eliminate re-work. They are manufactured with fire resistant, waterproof, mildew and rot resistant vinyl and slide along a 16-gauge track and roller system. And it’s a lot easier and less costly to move one of these ‘temporary’ walls rather than a stud-wall if the floorplan in a woodshop needs to be changed to accommodate new machines or processes. A less durable but quicker solution, especially on jobsites, is the ZipWall (zipwall.com). This is essentially a system that hangs plastic sheeting to protect dust-free areas such as offices or rooms in a home or business when cabinets and countertops are being installed. A ZipWall dust barrier can be set up in just a few minutes without ladders, tape or damage. In addition to clear plastic dust barrier, the company offers reusable fabric dust barriers, entryways for plastic barriers, and the ability to create a room within a room, cover a door, seal off a hallway, or seal a barrier without tape. The company has just introduced a new self-closing, reusable, magnetic door (it measures 7’-2” by 4’-7”) that allows woodworkers to pass through plastic walls hands-free, which is great when you’ve got an armful of cabinet doors or tools. Every expert says that collecting dust at its source is the most important part of any system. A shop can have the best bag collector available, but if it doesn’t grab the waste right at the tool in an efficient manner, it is not doing its job. One of the most efficient ways to do that is to spread out the vacuum, so that it’s wide enough to grab everything without losing velocity. And the best way to do that is with a downdraft table. 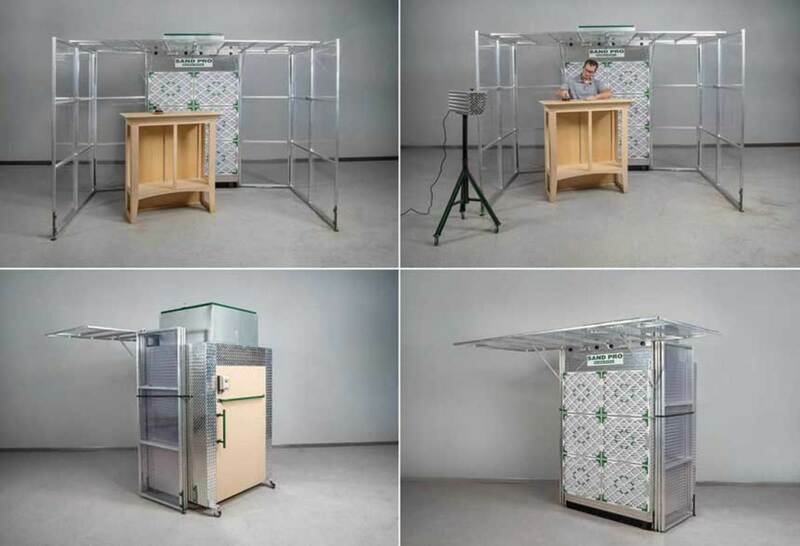 Dynabrade (dynabrade.com) offers one of the most comprehensive lines of industrial-grade downdraft sanding tables, with some 20 variations listed on its website. Grizzly Industrial (grizzly.com) offers several small tables and kits, plus some large industrial units such as the G0631. This relatively inexpensive unit has a work area of roughly 25” x 76”, which is large enough for two people to work side-by-side, or for big parts such as pantry doors or windows. It has twin 1-hp motors and squirrel cage fans. 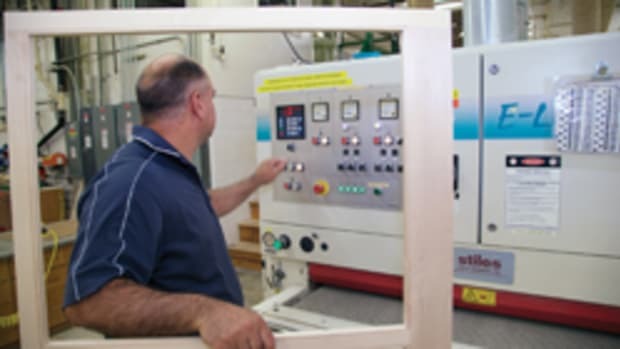 Baleigh Industrial (baileigh.com) offers two well-priced options, a 35” x 19” unit and a 59” x 21” table, the latter having the capacity to be split so that a woodworker can use only half at a time when sanding smaller parts. Both operate on household current. One of SandMan’s downdraft tables, the DL7236, is height adjustable from 34” to 38”. The ideal workbench height is half as tall as the person using it, so these can be custom set for woodworkers who are in a range from about 5’-8” to 6’-4”. That’s an important consideration if you’re going to be standing at the table for full shifts. The company’s eight models range from 48” x 26” to 96” x 48”. For small shops and hobbyists, Rockler Woodworking & Hardware (rockler.com) offers a range of tables, accessories, plans and kits. Sweep the floor as often as it’s needed. If there a constant light film everywhere and you can’t locate or fix the source, then order some inexpensive wide dust mops from a supplier such as U-Line and squirt the head with an antistatic spray before sweeping the floor. These 36” wide mops make quick work of cleaning an area, and they also eliminate the chance of an employee or customer slipping. Vacuum on top of the ductwork about once a month. Shake and beat the bags when you empty them, if your collector doesn’t do that for you. Change filters on the HVAC system more often. Sometimes the most expensive filters are designed to collect finer particles so they clog up quickly. Ask a furnace or air conditioning contractor for a recommendation. There’s some argument about the effectiveness of over-the-bench filtering devices. These are essentially boxes with a fan and some filters that are suspended from the ceiling, and while they may not help as much as one might hope, they certainly won’t hurt. Their function is collecting airborne fines, and one of the arguments is that because of convenience they are usually located above a bench (unlike a downdraft table). And because particles are subject to gravity, they tend to fall down rather than up. However, many fines are so light they will catch any draft or current in the air, and when an overhead filter is running it does create a decent airflow. They’re also quite inexpensive, so all-in-all, most woodworkers will benefit from buying one. Small- to mid-size woodshops looking to upgrade dust collectors will also find lots of choices at Cantek, Festool USA, Grizzly Industrial, Harvey Industries, Laguna Tools, Nilfisk, Oliver Machinery, Penn State Industries, Rikon, Shopsmith, SurfPrep and Woodstock International. Large industrial shops can visit the websites of Atlantic Machinery Corp., Dekker Vacuum Technologies, Dust Collection Products, Felder Group USA, HafcoVac, Hendrick, Hermance Machine Co., Iron Bull, Martin Woodworking Machines, Preston Machinery, Scientific Dust Collectors, SCM Group North America, Sternvent and Stiles Machinery. 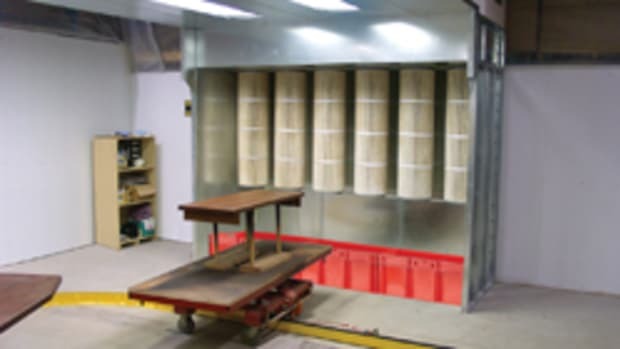 Listings of dust collection and related suppliers can be found in the Woodshop News’ 2019 Resource Guide that accompanies this issue. The 2019 Resource Gude is also available on the magazine’s website at www.woodshopnews.com.